Jenny Garza signs the dotted line to attend Lindenwood University on a Wrestling Scholarship. She is set to begin at the university in the Fall of 2009. 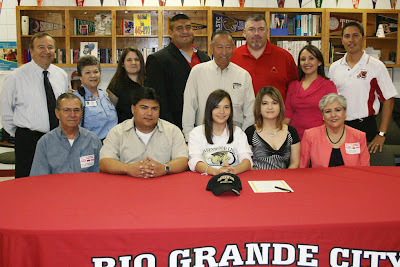 Garza has been on the Rio Grande City High School Wrestling team for four years and has won numerous awards. She is currently ranked No. 1 in Region 4 and ranked No. 4 in the State. Pictured are Jenny Garza with her family members, the Lindenwood University Representative, Rio Grande City High School Wrestling Coaches, Athletic Director Rey Ramirez and Principal Jorge Recio. Family and RGCCISD personnel congratulate Jenny for her achievements.